This new food is characterized by a high palatability, dogs like its taste and therefore is highly recommended for dogs whimsical. In addition Arion fish & rice is a food highly digestible both by its composition as by its format. Incorporates rice as a carbohydrate source and tuna as protein, in addition to the new design of the particle promotes the chewing of dogs. Lamb, rice, chicken, tuna, according to the varieties, as the main sources of protein of high quality that ensure stool compact and an excellent palatability. Acids omega-3 and omega-6, which contribute to a healthy skin and elastic, a hair shiny, silky and flexible, which are the unambiguous symptoms of good health. Extracts of cassava that reduce the unpleasant odor of the droppings of your pet. This ingredient, of vegetal origin, improves the digestion of foods rich in proteins and allows for better assimilation and absorption of the same, lowering the volatile compounds that cause the unpleasant odor of feces. Chelates that are used as a support of minerals in food and greatly enhance the absorption of copper, iron and zinc. Among the benefits of chelates is the increase of the capacity of transport of oxygen by the blood, increase in vitality, improvement of the capacity of immune system, absorption of minerals, absence of problems of interactions with other macro and trace minerals, high biological availability, increase quality mineral food. 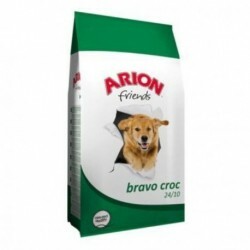 Description: Arion fish&rice vital 26/14 is a complete food for maintenance of adult dogs. To incorporate tuna and rice in your composition, it is especially suitable for dogs with sensitive digestive and for the care of the skin and hair due to the high contribution of fatty acids omega-3.